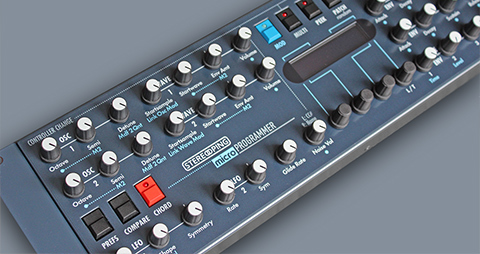 Edition '80' and 'Matrix' of Synth Programmer currently sold out. 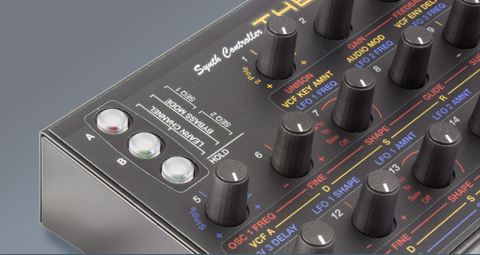 With 16 knobs and 3 coloured LED-buttons, this hardware midicontroller offers realtime-access to up to 48 parameters. 45 knobs, 4 encoders and a 16x2 character display for editing ALL parameters of: Matrix 1000/6/6R, Microwave, MKS-80, Rhodes Chroma and Prophet VS.
Convertible from 19" to desktop - and back.